The historic Český Krumlov Castle in the small city of Český Krumlov, in the Czech Republic, was built in the mid-13th century by the powerful Rosenberg family, who played an important role in the medieval history of the country. Members of this family held positions at the Prague royal, and later the imperial court, and were viewed as powerful lords of the Kingdom of Bohemia. 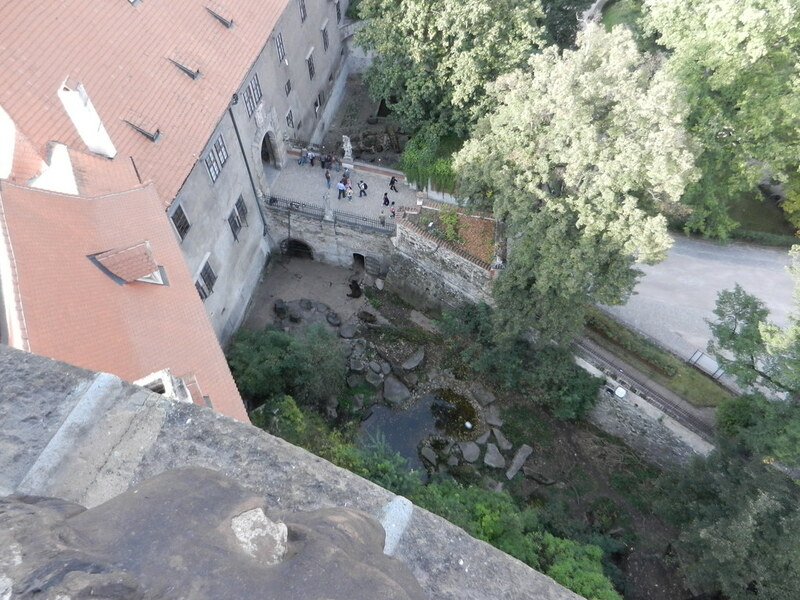 The Krumlov Castle is unusually large for a town of Krumlov's size. It is the second largest castle in the Czech Republic, after the Hradčany castle complex of Prague. The mighty castle stands on a rocky promontory with the Vltava river flowing on one side and the Polečnice stream on the other. The castle complex contains forty buildings and palaces, five castle courts, a large rococo garden, and an extensive bridge over a deep gap in the rock upon which the castle is built. One of most interesting feature of the castle complex is the protective moat between the first and the second courtyards. In this moat, the Rosenberg family kept bears, a tradition that has been kept alive by the castle’s successive owners till today. The Rosenberg family had a long association with bears. Legend has it that the Rosenbergs were related to the noble Italian family of Orsini, whose family name comes from the Italian word “orsa”, which means she-bear. The bear motif is also found in the Rosenberg’s coat-of-arms, in which two bears are shown as shield-bearers. Bear-keeping at the Český Krumlov Castle started during the time of Wilhelm von Rosenberg, in the latter half of the 16th century. Originally, the bears were not kept in the moat, because the moat didn’t exist then —it was dug only at the beginning of the 17th century. After the death of Wilhelm in 1592, his younger brother, Petr Vok, assumed the position of reigning lord. But Petr was forced to sell the castle to the Romans in 1601. His death, a decade later, brought to a close the three-hundred-year-long reign of an illustrious dynasty. The first record about bears being kept in the moat date from 1707, when four bears were held there. Bears were kept in the moat throughout most of the 18th century. There were two long gaps in the 19th and early-20th century, when the moat remained uninhabited —the first lasting more than fifty years, and the second for twenty years. In 1907, bears returned to the moat, and since then, the moat has never been bear-free. As of January 2000, the moat had four bears and two cubs. Every year at Christmas and on the occasion of the bears’ birthdays, the castle operators organize bear festivals. During these occasions the moat is festively decorated and there are piles of presents and food for the bears. The bears and these festivals are very popular among children visitors of the castle.